Several batches and many hangovers later, I decided to take my show on the road, combining my love of grain-based alcohol and the cutthroat spirit of competition by entering my first contest, the 2013 Midwinter Homebrew Competition. Clearly, the judges were already drunk as I won two gold medals but lest any man be the wiser, I packed up before they could sober up and change their minds and went to the 2013 Drunk Monk Challenge where, yet again, drunkenness prevailed and I placed four out of four. Realizing the benefits of a sport based purely on compromising the sobriety and clarity of the judges, I continued entering myself in competitions and continued to place, receiving a bronze medal for my IPA and a silver medal for my Cream Ale at the National Homebrew Competition. 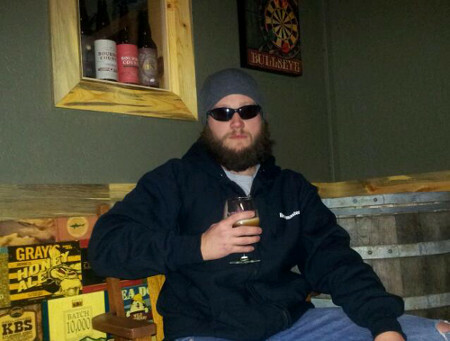 It wasn’t until in a moment of narcissism I googled myself and found out that I was actually in the running for Midwest Homebrewer of the Year. I believe the keys to making good beer are keeping things clean, using the freshest high quality ingredients, keeping things clean, and keeping my judgment compromised by continuing to taste test every batch (several times)...did I mention keeping things clean? I still stick with all grain brewing and brew on a temperature controlled constant pump circulated brew stand with three converted kegs. I continue to wage my war on sobriety today, making new beers and perfecting old ones, all by using my friends and family as (very willing) guinea pigs. A big Michigan thanks to Bell’s Brewing Company General Store in Kalamazoo and Siciliano’s Market in Grand Rapids for carrying the best in beer based chemistry set needs and ingredients. An even bigger thanks to my very patient and very bossy wife, without whose constant love and support, and most importantly nagging, I would have never had the courage to enter my first competition. A special thanks to my sister-in-law who despite living in a non-English speaking country has still mastered the language better than I ever could and without who this would not be worth reading.